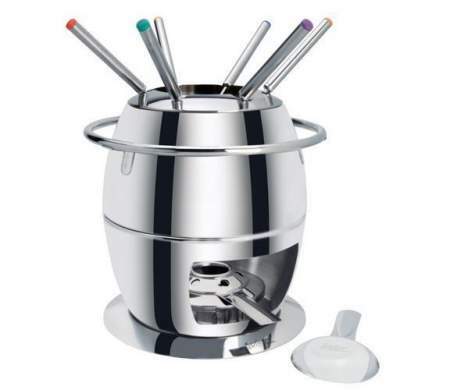 Spring cookware, fondue sets and raclette grills are made to satisfy even the most demanding home gourmet, with top-quality workmanship and unique materials. And the standards of professional chefs also set the standard for Spring's home products. The fondue set Gstaad is complete out of high mirror polished stainless steel. The pot has a removable splash guard and is suitable for all stoves incl. induction. The paste burner and the 6 meat forks are made of stainlees steel, too.